Fantasy Mosaics 8: New Adventure is rated 3.7 out of 5 by 11. Rated 5 out of 5 by klaaselady from Love these games I have every Fantasy Mosaic game and have completed all except this new one. Love the logic challenge. I wish they would add a fourth color! Rated 5 out of 5 by sunnyglow from OFF TO A FANTASY GARDEN WITH A NEW O'EKAKI GAME A BIG THANK YOU TO BF! LOVE THESE GAMES We have a new game from my favorite dev for the O'Ekaki games (AKA Pic-a-pix, Nonograms, Paint by Numbers etc.) This dev provides additional features the others do not: multi- colored grids, a choice between Casual and Advanced settings, and autofill (fills in the empty spaces for you after you have completed a row or column) which is such a nice feature. Filling in those X's by hand gets to be tiring. Grids will range from 5 x 5 to 25 x 25 if they are like the previous games. There are over 100 games to play. They have also upped their graphics! To me this is the BEST developer of this game on this site. I had completed the last one from this dev and was hoping they would come out with the next one. I play these to center my thoughts as I try to figure out work related problems Bizarre - I know but it helps! Not for everyone - however, again BF provides games for about everyone! SO FRUSTRATED! I now have to leave shortly and must wait to play this game! Rated 5 out of 5 by pennmom36 from Moving The Family To The Forest I've always assumed that penguins were native to Antarctica, but that's not how this penquin rolls. Nope, he's moving the family to the forest! Every step you take in this Fantasy Mosaic, helps you explore and discover the forest he has chosen to raise the family. (filling in the garden) The object of this mosaic game is to fill in the correct number of cells on grids of various sizes. There are numbers on each row as well as columns, that require you to figure out the correct placement of those groups of numbers, using logic (and sometimes hints) Each set of numbers must be separated by at least one empty cell, if you get stuck, simply switch to the next color available which will help by eliminating cells which make the grids smaller because of the available cells remaining. Fantasy Mosaics are famous for the variety of vivid colors available, such as Magenta, Yellow, Purple, Red, Teal, Navy Blue and even Brown, which make the puzzles much more entertaining. When all of the colors have been completed, it reveals a picture of various objects like lanterns, Houses and even a colorful Octopus! Some of the cells have bonus coins that are released when you correctly fill in that cell. You will receive extra hints, tools and even the right to make a third or fourth mistake. You can earn Bronze, Silver or Gold trophies depending on the amount of time it takes you to finish the puzzle, the amount of mistakes, and whether or not you use hints or bonuses. There are two modes of difficulty available, Casual which crosses of the numbers one by one automatically, and Advanced which only crosses off the numbers when the entire row or column has been completed. Either way you cannot go wrong with this series whether you are a beginner or a pic cross expert, enjoy! Rated 5 out of 5 by mrm2006 from Help the Penguin and His Family Once Again! I LOVE the Fantasy Mosaics series and am on my 3rd profile and going through games 1 - 7 with my goal as a "gold" for every picture. Not so easy and with a lot of repeats on some. Now, we are up to No. 8 in the series (as indicated in the Game's title) when No. 7 couldn't have come out THAT long ago. Ok by me .... I am over the moon that there's a new one. The graphics are amazing. Just gets better with each new game. The music is quite different. I suppose it may be meant to be soothing and relaxing but it made me sleepy so I turned it down. As usual, there's a storyline about our friendly penguin and his family. Of course, it's all about filling in blocks with a "color" or an "x" when it's a blank block. With the corresponding numbers around the "graph" it should be fairly easy to do. NOT! The DEVS have added another color so we have 4 to work with this time around. YAY! Colors ..... I see colors ..... There's a tutorial at the beginning which is helpful and a Casual or Advanced mode of difficulty. Casual lets you repeat JUST a single 'picture'. In Advanced you have to repeat the entire level. Nothing is timed. I recommend it for beginners to experts. It's easily a standalone game, although I enjoy the continuing storyline throughout the series. So, when it comes out on BFG it will be a DEFINITE purchase for me. Come along and join me in the latest journey of our Penguin and his family. ENJOY! Overall Impression: Enjoyable storyline and for those who like (love like me? ) this type of gamel I would STRONGLY recommend at least playing the demo. Definitely worth at least a PCC on Double Punch Monday at BFG. Rated 4 out of 5 by arnold1049 from ANOTHER GREAT GAME IN THE SERIES I love these mosaic games where the squares are filled in colors and the board changes depending on which color you are working with. If you get stuck on a board, changing to a different color to work on that board often solves the problem. 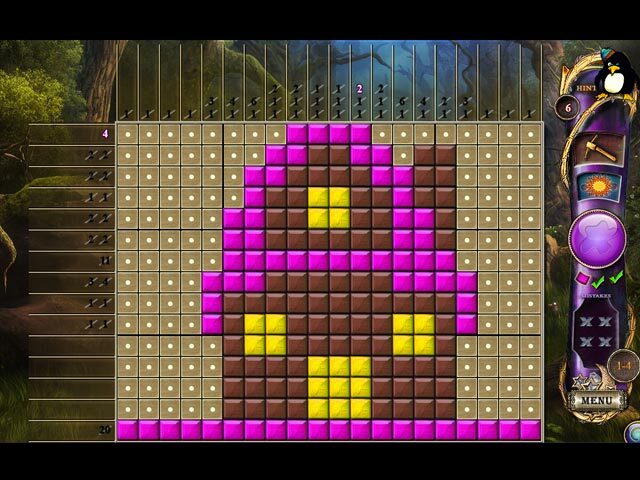 It is the same board, it just shows only the tiles available for filling in with the particular color you are using at the time. 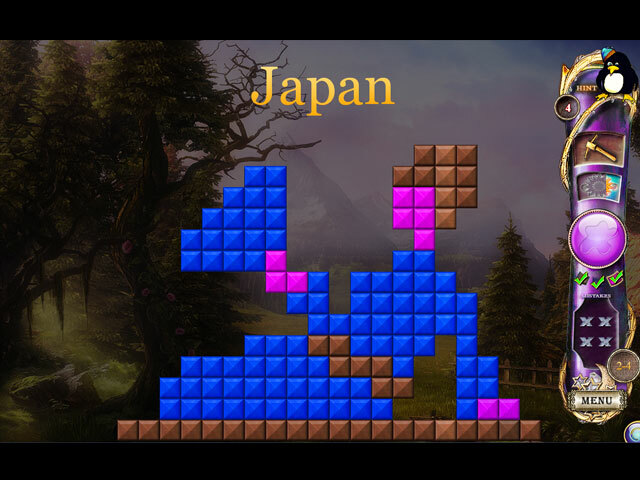 If you aren't familiar with mosaic games, you fill the board by clicking on tiles according to the numbers at the top and left side of the board. These numbers tell you how many tiles and in what sequence the tiles must be flipped in each column and row. This game had an "advanced" option to make play a little harder. In most mosaic games, when you have turned over a set of correct tiles, the number at the top or side of the board will be crossed off, allowing you to better understand the correct sequence of flipped tiles. The advanced mode in this game does not do this, so even when you think you have isolated a correct sequence, you won't know for sure. The numbers at the top and side of the board only get marked off when the column or row is completely and correctly. I liked this option, because it also saved me a lot of clicking, as once I had flipped all the correct tiles, the game automatically filled the rest of the row or column with the inactive tiles. Once all the colors are completed, the board actually displays a picture of something familiar, not just a random pattern. There are twenty locations and 5 boards in each location. The object is to get a star for each board in order to unlock the next board. So far I have only seen gold and silver stars, either of which will unlock the next board in the location. If you make one mistake, you lose the chance at a gold star. There are no achievements to win, just straight-forward game play. There are hints available and additional hints can be won during play. Two power-ups also help, but they have to recharge after use and they recharge extremely slowly, One is a pick axe that will reveal one tile, the other is a sun symbol which will reveal several tiles in an area where it is placed. You start out with being able to make two mistakes without having to start over. However, as stated above, a single mistake takes away the gold star. If you make more than the allowed mistakes you are exited from the board and asked if you want to try again. Or you can restart the board yourself, which is what I do as soon as I make that first mistake. During play you also win additional allowed mistakes, I think to a maximum of 4. I would rather have more hints than allowed mistakes so I can keep the gold star. These board are challenging and one slip of the cursor and there goes the gold star. I play the boards over and over until I get the gold star. Most of the time I'm able to complete the boards in one play, but once in awhile I run into one that takes me many tries before I get it done without a mistake. This game is interesting, enjoyable, challenging, keeps your attention and works your brain. What else could you ask from a game? Rated 3 out of 5 by Monchien from A little tough on the eyes As with the other Fantasy Mosaics, you have to complete some graphs by turning on coloured blocks, following a sequence of horizontal and vertical numbers and spaces. It is a relaxing game, with very easy instructions and soft music that can be turned off if you wish. Backgrounds are beautiful ; unfortunately, they are very rapidly hidden by the game area so we cannot really admire them. 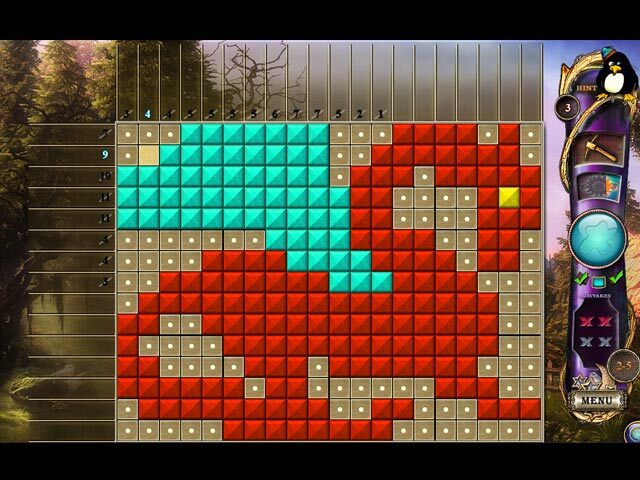 If you already have previous games in the same series, you will not see much difference between Fantasy Mosaics 7 and 8. However, I must admit that I find the graphics in FM8 quite uneven (some very well detailed, some much too simple). And the constant flashy and saturated yellow in FM8 makes it tough to look at after a while. If you never played Fantasy Mosaics, I suggest you try FM7 instead of FM8. Fantasy Mosaics 7 includes as many colours as the latest version, but the themes are better diversified and the colours are a bit easier on the eyes. Rated 3 out of 5 by sandipuppy from Way too easy You would think that after 8 editions they'd up the challenge level a bit. Most of the puzzles in the demo I finished in under 5 minutes. Yes, they added a new colour but that just makes it easier to find the solution by default. Just change the colour. Sorry guys....I can not recommend this game...maybe for kids but not for anybody with any experience doing this type of puzzle game. Rated 3 out of 5 by CyndiLouWho2 from Great Game Idea But Lazy Developers Once again, we have yet another Fantasy Mosaics. I agree that this series of games can be solved logically and it's quite challenging at times to achieve a perfect three-star scoring. You're forced to concentrate on what you're doing and I like that -- I find it therapeutic. So, those are the reasons I like the series. But this 8th installment STILL lacks the basics which continue to frustrate me: * There are no new features in FM8. Nothing has changed or been improved. * The music is high pitched and is basically the same in all these games. I always end up turning off the sound and turning on my MP3 player. * Graphics are cartoonish and poorly drawn. You would think by the 8th game that things would have improved. * Animation is in slow motion. Scenes change slowly and you cannot skip dialogue. It's old timey technology from twenty years ago. * If you want to restart a grid, you can't just hit a restart button, you have to exit out to the main menu and then click on several screens to get back to where you were. Restarting should be a heck of a lot easier. * The same fill-in colors are used over and over again -- yellow, hot pink, brown, navy, aqua, red & bright green. A lot of the solved pictures are of animals, so why not make them more realistic by using more than seven colors?? * Either have a real story line or don't bother. Why does it always have to be a penguin taking his family on a fantasy adventure? Phrases are not translated properly and most of the time are downright creepy. Fantasy Mosaics 8 game play is geared more for adults, so the silly, childish graphics really aren't necessary. Adding several more colors to the grids and dropping the juvenile story line would make this a 5-Star game. 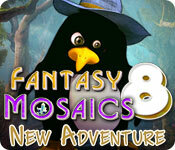 I recommend trying Fantasy Mosaics 8 only if this is the first time you're playing one of these games in the series. However, if you already own several games in the series, I recommend you simply replay those games and not spend the money on this one. Rated 2 out of 5 by psylocibin from too cumbersome I like doing these BUT I have some problems controlling my cursor so I like it when I start a row and if I stray from that row the squares I am indicating get picked up anyhow. In this game the indication gets lost completely and one has to start the row over. I like games that cross off the numbers that are completed. In this game if you have gotten two that are absolutely certain, the game still does not indicate that. After you have gotten the first color filled in, the rest are fairly boring and obvious. So then it is not a matter of figuring out but simply busy work coloring in the lines One nice addition is the advanced feature that fills in the blank spaces once the row is completed. That speeds things up and diminishes the amount of clicking. That one good innovation that I hope others will add, does not overcome the annoyance of the other aspects that I point out here, so this is a no buy for me.